Long Time Human Rights Leader and San Diegan, Roberto Martinez passed away peacefully and has finally gone home. We will have more details later as to funeral arrangements and other plans. The family is very grateful for all the prayers and support which are still very much needed. 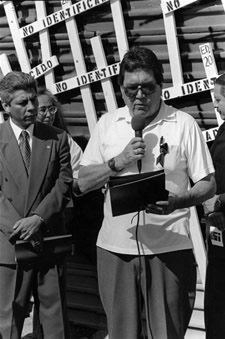 His commitment to human rights was a life long commitment from his work with the Catholic Church, Chicano Federation, American Friends Service Committee and finally with Border Angels. Roberto will never be forgotten and as his life and legacy will live on forever.The family continues to be very mucjh in need of financial support for funeral and other costs. Thanks to all that have supported directly to family, through PIQE, through AFSC or through BORDER ANGELS. We will keep you advised as to future plans and arrngements. Please respect the families privacy during this challenging time and let us know if you wish to express sympathies or contact family. You can make donations to to support the Martinez family. The Parent INsitute for Quality Education (PIQE); The American Friends Service Committee. and Border Angels. Border Angels: Mail your donation to Border Angels, PO Box 86598, San Diego, CA 92138. List Roberto Martinez in Memo. You can also make a donation through paypal at www.borderangels.org. If you have any questions contact Enrique Morones at enriquemorones@cox.net. It is with deep respect and sympathy that we bring you the news of Roberto Martinez’ passing this morning. He passed away peacefully surrounded by his caring wife Yolanda, his children and grand-children. He was 72 years old. With a soft voice but a relentless spirit, Roberto Martinez spoke truth to power in the face of violence fomented by governmental policies. He exemplified with integrity and compassion the cause in defense of human rights, despite police harassment and death threats; he never succumbed to the pressures of those in power. His determination in advocating for justice, peace and dignity is the legacy that he leaves us and one that we hope to continue. Today a voice that acted as a beacon of light for the cause of human rights for the borderlands has been silenced, but his spirit and legacy continues. > irreparable loss for their family and our community. We will update you shortly on future plans and services for Roberto Martinez. I love my grandpa Roberto Martinez so much and miss him dearly. Newer Article: The heart of Ocean Beach – Will hamburger prestige complicate the simple life?